Varicose veins are gnarled, enlarged veins. Any vein may become varicose, but the veins most commonly affected are those in your legs and feet. That's because standing and walking upright increases the pressure in the veins of your lower body. As blood rushes through our legs, the veins send it back to the heart. However, over a period of time, due to the force of gravity, the veins lose their ability to push the blood upwards, causing the blood to settle down in certain areas of the veins. 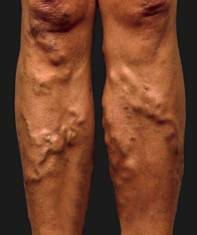 This condition is known as varicose veins. The basic cause of varicose veins is failure of valves to prevent the backward flow of blood. Other causes include defective valves since birth, obesity, hormonal changes occurring during puberty or pregnancy, ageing, leg injury and a family history for the disease. Prolonged standing or sitting and poor posture also increase the risk. Women are more likely to have varicose veins, especially during pregnancy. In some cases, these veins may rupture and cause ulcers and blood clots. Varicose veins mostly occur on the thigh or calf, where they are close enough to the skin to be seen. However, they can occur in other parts of the body as well. Vein damage may occur due to injury, blood clot or inflammation. If there is trouble in your deep veins, you usually have pain and swelling in your leg as well. Swollen surface veins can be a symptom of damage to your deep vein. Varicose veins are a relatively common condition, and for many people they are a family trail. Women are twice as likely as men to develop them. In the United States alone, nearly 10 percent of all adult men and 20 percent of adult women are affected by them to some degree. Yoga is very effective in treating Varicose Veins. It helps in alleviating pain and also prevents future attack. Yoga's stretching and relaxation techniques can be particularly beneficial for varicose veins. Certain positions, such as the Plow, Corpse, and Half Shoulder Stand, promote circulation and the drainage of blood from the legs. The deep-breathing exercises in yoga may further alleviate discomfort by getting more oxygen into the bloodstream. Yoga is an effective protocol for preventing and treating varicose veins. The posture that is known to be clinically most effective in both cases is sarvangasana, the shoulder stand (shown), where the legs are inverted and the pressure of gravity is reversed. In this pose, the blood and the lymph drain from the lower extremities back to the heart, thereby reducing the pressure of the pooled blood in the veins. Do this pose once daily. With a recommended holding time of about three to five minutes. When you stand up, movement of these fluids in the legs is greatly improved. There are many yoga breathing exercise, which can be immensely helpful in reducing varicose veins and is particularly helpful in preventing them from getting worse. In this pose both the legs are raised upwards and so is called 'dwipada' (both legs) uttanpadasana.It promotes in stretching the thigh and stomach muscles. It also promoted the efficiency of stomach organs like the small intestine, enzymes producing glands and various others. The vertical position of legs helps in proper blood circulation through the legs. Pada Sanchalanasana is an Indian translation for Cycling Pose. Good for hip and knee joints and for varicose veins.Strengthens abdominal and lower back muscles. Tones up the thigh muscle and bumps off extra fat around the waist area. This pose moderates the hip elasticity among those women who has just delivered a baby. Jhulana Ludhakana is an Indian translation for Rocking and Rolling posture. This pose is very much useful in treating varicose vein probem.Gives a good massage of entire back, buttock and hip area. Knocks out the unnecessary fats of waist area. Gives fresh feeling performing this asana in the morning after brisk walk. The Spinal Twist Yoga Pose, which takes its Sanskrit name from the great Yogic Sage Matsyendra, is one of the few Yoga Poses in the Basic Session that rotates the spine. Most bend the spinal column either backward or forward, but to become truly flexible it must be twisted laterally as well. The movement also tones the spinal nerves and ligaments, and improves digestion. Keep your spine erect and your shoulders leveled in the position. Breathe steadily. Twist a little more each time you exhale. Pavanan means wind and Muktha means escape or relief. Pavanamukhtasana is aimed at releasing gas accumulated in abdomen and at joints. This exercise is a good treatment for gastritis and vata related pain and for varicose pain. This asana strengthens muscles of abdomen. It gives strength and flexibility to backbone and muscles at back and lower back. This exercise strengthens the belly muscles, the legs and the lower back. It is also beneficial to those with kidney, thyroid, prostate and intestine problems. The Boat Pose is a great stress reliever and also improves digestion. This yoga pose is suitable for the people of all ages. It is used to increase the strength of the entire body. This posture takes its name due to the boat like shape taken by the body during this exercise. This asana is sometimes called a "candle" because the body is kept straight as a candle in this posture. The Sanskrit sarvangasana means 'all the body'. This asana has countless benefits. Sarvangasana activates most of the important glands and help improve their function. This asana is equally important for both men and women. It can be tried by persons of all age levels. It also helps cure varicose veins and hemorrhoids. • Exhale and Inhale deeply while raising your both legs and spine until they make angle of 90 degree with the floor. Attain the Uttanpadasana posture. • Exhaling raise the waist and push the legs backward over the head. Support the waist with both the hands, using your hands get the legs, waist and back in one straight line and stabilize them in this position, stretch the toes towards ceiling. Keep your spine, legs straight and sight on the toes. • When the body has been raised to a maximum point stay there and breathe slowly and deeply with the abdomen and concentrate on the thyroid gland. Chin is placed in the Jugular notch forming a tie which is called 'Jalandhar Bandha'. Stay in this position for ten to fifteen seconds during first week. Gradually develop the time to one minute in a month. • To come out of this posture, Inhale and exhaling, slightly lower the legs towards head and maintaining the balance of the body remove the hands supporting the waist back to the normal position. Inhaling, place the waist on the ground keeping legs straight as in the Uttanpadasana. Exhaling, bring legs back to the normal position without jerk or speed. The Sanskrit word sirsha means head. This posture is the well-known headstand posture, and perhaps second only to the padma-asana or lotus posture, is widely identified with the practice of Yoga. It improves many ailments, such as nervousness, tension, fatigue, sleeplessness, dullness, fear, poor blood circulation, bad memory, asthma, headaches, constipation, congested throat, liver or spleen, for female disorders, the initial stages of eye and nose troubles, and general lack of energy, vitality or self confidence. • Sit in a kneeling position with the buttocks resting on the heels of the feet. • Lean forward and place the forearms on the floor in front while keeping the elbows about shoulder distance apart. Interlock the fingers of both hands. • Place the top of the head flat on the floor with the back of the head pressed against the inside of the interlocked fingers. • Placing the tips of the toes firmly on the floor while lifting the heels, raise the knees off the floor. • Hold for the duration of the held inhaled breath. When you can't hold the breath comfortable any longer, slowly exhale and return the back to the floor, slide the legs out straight returning to the shava-asana. Tadasana is the foundational posture for all the standing poses. This posture helps maintain your meditative focus, patience and awareness. This is a traditional posture. The final position of this asana resembles the palm tree. Palm tree is usually erect and straight. Therefore, one should stand straight and erect in this asana. • Stand erect, legs together, hands by the side of the thighs. Gaze in front. • Raise your hands straight in front up to arms. Palms facing each other. • Bring the hands up straight fowards sky, fingers pointing upward. • Now slowly raise your heels and stand on toes. Raise heels as much as you can. Stretch body up as much as possible. • While returning to the original position, bring your heels on the ground first. • Slowly bring down your hands also. The Sanskrit term 'Pada' means 'foot' while the other Sanskrit term 'Hasta' connotes 'hand'. While in Padahastasana, you will have to catch hold of your toes with the hands. Hence it is known as the 'Hands-to-Feet Posture. The tendons and ligaments of the thighs and legs are well stretched and the hamstring muscles at the back of the thighs are strengthened by this practice. It also gives a good pull to the sciatic nerve. The ankles, calves, the back of the thighs, hips, waist, back, shoulders and neck are all well exercised and blood is rushed to all these parts. • Inhale slowly, and then exhaling slowly bend forward as much as possible. Try to touch your knees, calves, ankles, or feet. Do the movement slowly and in a relaxed manner. • Bend a little more and try to place the palms, with fingers pointing forward, on the ground on either side of the legs. • Place the forehead between the knees. Stay in that position for 5 seconds or more time as comfortable to you. • To release the posture, bend your knees slightly, press the soles of your feet downward and drop your tailbone, gradually bringing up the squeeze as you return to return to the original starting position. • Repeat two to four times. All the foot and calf asanas help in returning the stagnant lymph and venous blood. They relieve tiredness and cramp, and prevent venours thrombosis especially in bedridden, post-operative patients. This asana helps to loosen the joints of the knee and the hip. It also helps to cure acidity and constipation..
• Lie flat on the back in shava-asana. • Inhale and raise both the legs to 45 degrees angle without bending the knees. • Bring the legs perpendicular to the ground and complete inhalation. • Bend the knees slowly and bring them towards the chest while exhaling. Keep both hands interlocked around the knees. • Keep the knees and toes together. • Raise head and bring the chin near the knees. Take small breaths in between whenever required. • Maintain the position for 2 to 3 minutes, and then return to Shavasana position. • Do this asana 3 to 4 times. Yoga is a Sanskrit term which means 'to unite'. What is being referred as the 'Yoga' in English, is more commonly known as 'Asana' in Sanskrit, which means different physical postures and poses. It is seen that people of a particular sun sign find it beneficial when they practice certain yoga asanas. According to astrological reports for yoga asanas the above mentioned asanas are said to be effective for those who come under the following zodiac sign.